Star Wars fans! Check it out! 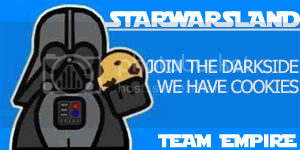 Go apply and choose a team (Jedi, Rebellion, or Empire). They issue SW-themed challenges and the 3 teams compete. Kelly/ xlivvielockex Erm... she's now a mod of the main comm, which means she can see all the screened challenge entries and I think that means (or should mean, for fairness's sake) she can't participate. ??? I'm not going to count her in our ranks. Yeah, screw it, I'm dropping. Tired of mod flakiness.